Korma is also pronounced as kormaa, qorma, kavurma, khorma and kurma. You can spell it whatever you want but the recipe is going to be same. It is the root of mughlai cuisine so you can name it as mughlai chicken too. You can make the gravy of this curry using yogurt, cream or coconut milk, it is totally up to you. I make it with yogurt for regular dinner but use cream when it is for a party. Are you already scared by thinking about the calorie? I know you must be thinking what will be the calorie of chicken korma curry. No doubt it is rich, in fact when you are planning for Indian food you should not think about calories at all, lol. It is around 400-500 cal per serving. If you are vegetarian then substitute the meat with vegetables and paneer. This recipe is good for 4-5 people. Cut the chicken into small cubes as shown in the picture, wash them really well and put them in to a mixing bowl. Add yogurt, shahi jeera, whole garam masala, ginger garlic paste, coriander powder, cumin powder, red chilli powder and mix well. Now take a pan, add oil. When oil becomes hot add this chicken and cook for three to four minutes. Now reduce the heat to medium and again cook it for 15 minutes. Now time to add fried onion and water to the chicken, mix well and cook for another 10 minutes. Finally mash the kasturi methi with your palm and add to the chicken. Cook it for 5-6 minutes more. Adjust your gravy by adding water. 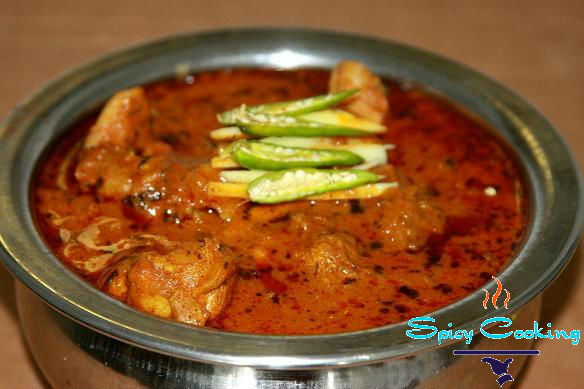 Now your delicious chicken korma is ready to serve hot with fried rice, roti, naan or poori. I and my husband love to eat this with plain basmati rice, we don’t forget about our favorite cucumber salad though. If you know any better version of chicken korma please share your recipe with us and connect with me by commenting here. Note: You can use mutton/lamb/beef instead of chicken, if you are a vegetarian then you can use your choice of vegetables with paneer. The house is filled with the aroma of the curry. Apparently my chili powder is super hot, but I love the heat. Tastes super yummy. I loved the idea of putting everything together and there was no chopping (besides the chicken). I got 2 little ones at home. This was a breeze to cook while attending them. Going to serve with Naan. Waiting for my husband to come and taste it. Thank you for sharing.